THINKstrategies announced today Rootstock Software has been named a winner of the Best of SaaS Showplace (BoSS) Award. This program promotes the measurable business benefits delivered by today’s Software-as-a-Service (SaaS) solutions. Rootstock Software is a provider of Cloud-based manufacturing, distribution and supply chain solutions built and deployed on the Salesforce.com Platform. The Rootstock Software-as-a-Service (SaaS) applications provide the control and visibility required to elevate the total performance of manufacturing, distribution and supply chain operations. THINKstrategies, Inc. announced today that Nvoicepay has been named a winner of the Best of SaaS Showplace (BoSS) Award. This program promotes the measurable business benefits delivered by today’s Software-as-a-Service (SaaS) solutions. THINKstrategies announced today that LawGeex has been named a winner of the Best of SaaS Showplace (BoSS) Award. This program promotes the measurable business benefits delivered by today’s Software-as-a-Service (SaaS) solutions. THINKstrategies announced today that JobDiva has been named a winner of the Best of SaaS Showplace (BoSS) Award. This program promotes the measurable business benefits delivered by today’s Software-as-a-Service (SaaS) solutions. AtTask has been named a winner of the Best of SaaS Showplace (BoSS) Award. This program promotes the measurable business benefits delivered by today’s Software-as-a-Service (SaaS) solutions. AtTask is a cloud-based Enterprise Work Management solution that helps marketing, IT, and other enterprise teams conquer the chaos of excessive email, redundant status meetings, and disconnected tools. Unlike other tools, AtTask Enterprise Work Cloud is a centralized, easy-to-adopt solution for managing and collaborating on all types of work through the entire work lifecycle, which improves team productivity and executive visibility. THINKstrategies, Inc., the leading strategic consulting company focused on the business implications of the Cloud Computing services market, announced today that Property Solutions has been named a winner of the Cloud Computing Business Value (CCBV) Award which promotes the measurable business benefits delivered by today’s Platform-as-a-Service (PaaS) and Infrastructure-as-a-Service (IaaS) solutions. The CCBV Awards is an ongoing program administered by THINKstrategies’ Cloud Computing Showplace to recognize Cloud companies that are delivering measurable business benefits to specific user organizations. These benefits can include increased sales, lower costs, higher customer satisfaction, faster operations and greater profitability. THINKstrategies is adding a dedicated area to its online resource center to showcase customer success stories in the Cloud Computing marketplace, and we are expanding our programs to help produce and promote these case studies to our growing community of followers. We are adding a new section to the Cloud Computing Showplace to highlight success stories that demonstrate the tangible benefits and new business opportunities being created by today’s leading Cloud Computing solutions. Contact us if you’d like to post links to your Cloud success stories on our Showcase. 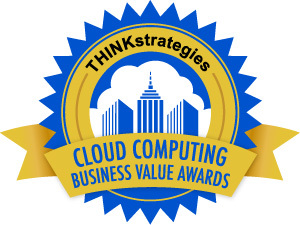 THINKstrategies is accepting nominations for the 2014 Best of SaaS Showplace (BoSS) Award and Cloud Computing Business Value (CCBV) Award. The BoSS and CCBV awards are ongoing programs administered by THINKstrategies’ Cloud Computing Showplace to recognize Software-as-a-Service (SaaS), Platform-as-a-Service (PaaS) and Infrastructure-as-a-Service (IaaS) companies that are delivering measurable business benefits to their customers. These benefits can include increased sales, lower costs, higher customer satisfaction, faster operations and greater profitability. The Awards program was launched in 2009, and has recognized over 100 companies delivering measurable business benefits to their customers. Click here to read THINKstrategies’ report which summarizes many of the winning nominations entitled, “Measuring the Business Benefits of Today’s Software-as-a-Service (SaaS) Solutions”. You can also find the most recent announcements regarding the latest award winners in previous postings on this blog.